Retreat into the tropical rainforest. Get inspired & make art. New dates & details to be announced shortly. 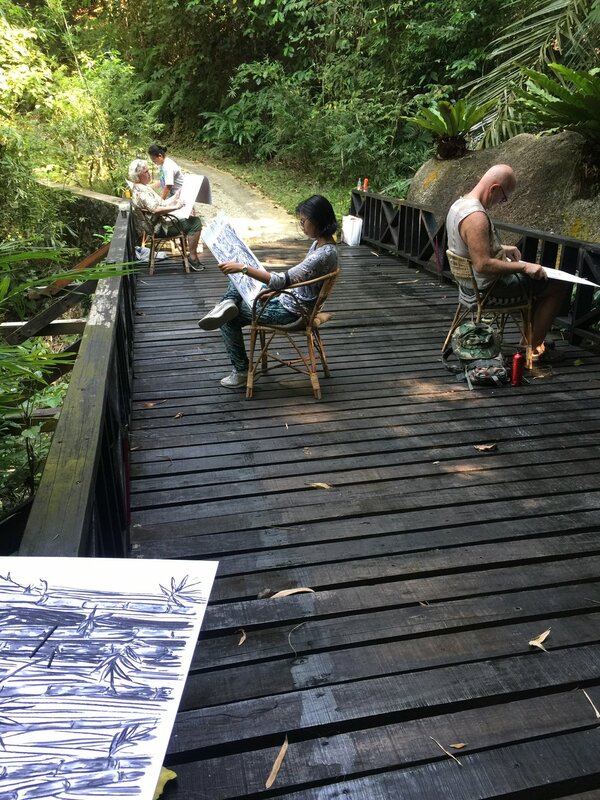 This artists retreat & workshop is geared at beginners & artists who wants to have a go at, or wishing to revive their practice of observing & drawing the small natural things that are around us in Malaysia’s wonderful jungle. You don’t need to be ‘good at art’. In the long run ‘getting good’ is about building a set of skills & practice, focus & the dedication of time. We’ll be looking close up & studying the structure of various subjects found around Tiger Rock & Pangkor, with an emphasis on jungle vegetation & the fish found at the local fish markets on Pangkor. Practice will be with pencil, pen, charcoal, oil pastel & paint. We will be working on location, out in plain air & at our artist work stations around Tiger Rock. A set of achievable goals will be set each morning & afternoon, & evening time can be spent working on an individual piece that will be worked on throughout the weekend. The whole weekend is about sketching, drawing, & painting your chosen subject matter. The practice of art is a form of meditation. It is relaxing & stress relieving. At Tiger Rock, no one will be judging you. Come draw, relax & play with a selection of art materials! Artist’s Retreat on Malaysia’s Pangkor Island. 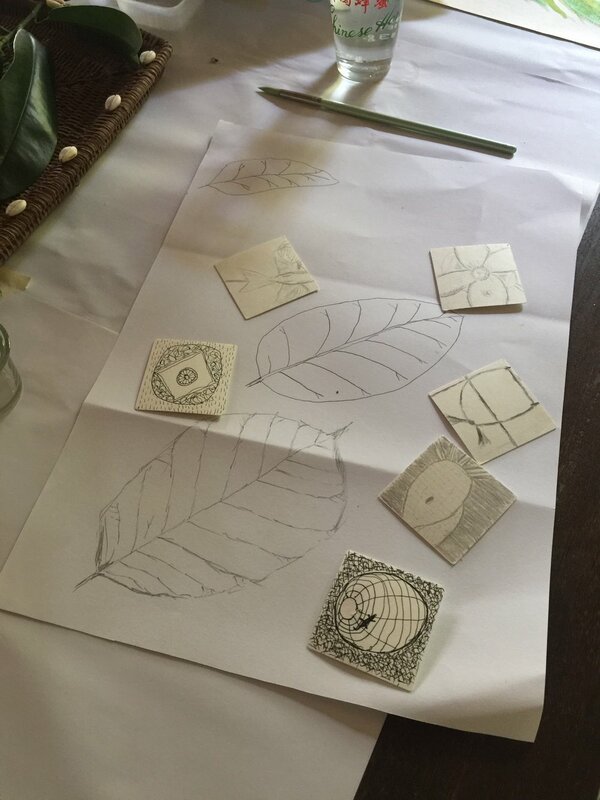 Be inspired to paint, draw & create while immersed in the tropical rainforest at Tiger Rock. Single Occupancy Room-RM1700 per person all inclusive for the weekend. Double Occupancy Room- RM1400 per person all inclusive for the weekend when sharing a room with a friend. All bottled/canned drinks & alcoholic beverages are charged separately. All meals are served at the Pool House at Tiger Rock. Please note that rental rates & charges do not include SST (Currently we are not legible to charge this.) All prices are quoted on nett basis. We have 7 available rooms at Tiger Rock. 4 rooms at Hill House. 2 rooms at Main House. The Studio. If sharing/double occupancy, an extra single bed can be added. Please let us know if you have any special dietary requirements, food allergies etc. *Other workshop dates will be set for later in the year. **Arrival in Lumut at midday latest. Please be on time. Meet & greet. Accompanied across on the ferry & transfer to Tiger Rock. Greeting at Tiger Rock Pool House. Room allocation & check in. Settle into rooms. Meet at Pool House to discuss & allocate art materials. Afternoon spent learning some techniques with various materials. Rebecca will talk about how to observe & ‘break down’ the pieces that make up a whole. Drawing practice will begin. Down time. Refresh in pool. The art of miniature sketches, 2 minute drawings, kaizen & completing a task. Gather at Pool House or Library Pavilion. A quick doodling session before dinner. Free to plan & work on a piece to which you will dedicate time & effort to complete. Morning observation & drawing session. Concentrating on shapes & making outlines. Island tour- 9am depart. Opportunity to sketch in the fish jetties. Return for lunch. After lunch doodling session based on morning observations. Early afternoon relax at pool. Charcoal drawing practice on a larger scale. Kaizan drawing practice before tea at Hill House. Dinner is served Poolside at the Pool House. Morning drawing & art session at Pool House. Last session of drawing & art using all the media together, in any way you like. Prepare for departure at approximately 3pm. Note: The itinerary is flexible & the details of the sessions are subject to change. - Participants must bring their own personal A5 sketchbook(nothing fancy) & an ink pen . Do not be too ambitious with the size or number of pages. Something that can fit in your hand & be carried easily. This is expected to be with you at all times during your stay. Tiger Rock will provide all other materials for use during your art filled stay. - Your camera or mobile phone for taking pictures to use as reference. You will need these to keep working on pieces as you go along. - Your own refillable water bottle so that we can avoid using single use plastic water bottles. - Swimsuit, easy walking shoes or sandals, insect repellent, sunblock. - Tiger Rock is in the jungle so there are mosquitoes around. Wear light coloured clothes. Bring loose t-shirts & light coloured loose fit pants to wear, especially in the early morning & afternoons. Don’t forget a hat & your swimwear. - Please inform us of any health issues, food allergies, dietary requirements before arrival. e.g. lactose intolerant etc. - You will be passed the telephone number of Mohan, our manager & can make contact with him on the day of arrival if there are any delays to arrival etc. - An island tour is included in the weekend. This is scheduled in the morning so that you can catch the busy breakfast & market areas on the island. - Massages can be scheduled at extra cost & time slots can be scheduled on arrival at Tiger Rock. Prices are set by the masseurs & Tiger Rock does not add on any extra costs to this. Pay them directly. first, unload luggage & passengers, then go park car. Please plan to arrive at the Lumut ferry terminal by midday latest so that the group is not delayed. Please note that in order to be met in Lumut & escorted across to the island, everyone should gather by 12.30 to be in time for a late lunch. You will be met at the ferry terminal & the ferry tickets are provided in cost. If you are late you will have to come across on the ferry at your own extra cost. You will be met at Pangkor Island jetty by Mohan who will transfer you to Tiger Rock. Want to extend your stay immediately after the artistic weekend? Can’t bear to leave just yet? We are happy to offer workshop participants a special rate of RM490 per person per night with full board, to stay on after the workshop. -Your place is confirmed on payment of the deposit on a first come first serve basis. -All bookings & payments are made directly with Tiger Rock. A 30% deposit is required to confirm your place for the weekend. -The balance of the invoice amount is to be paid in full 1 week prior to arrival at Tiger Rock. -All payments can be made by Bank TT or into our PayPal Account. If you wish to pay by PayPal, please let us know & we will send you the link. You do not need a PayPal account. Just a credit card. -Please note that payments from overseas cannot be sent in Ringgit Malaysia. -Please convert the total amount into your own currency, Singapore Dollar, USD, Euro or Pounds Sterling etc. before sending by bank transaction to avoid refusal & extra charges. -All bank & PayPal transaction charges are borne by the customer & are non-deductible from the total invoice amount. -Please note that we do not accept credit cards at Tiger Rock. Any balance of payment for items at Tiger Rock (e.g. alcoholic beverages, canned soft drinks, henna, massage etc.) can be made by cash. ATM machines on the island enable you to access cash. -We do have safe boxes for guests on the property. -We do not accept responsibility for loss, damage or injury to person(s) whether fatal or otherwise, or to personal effects arising from whatever cause. It is expected that guests have effected their own travel insurance against any normal risks associated with travel. Within 5 days of arrival:1 night for each person is charged. Within 14 days of arrival: Deposit is forfeited.